Over the course of the few months, there have been quite a few articles popping up on how dangerous in can be working in grain bins. Today, we want to take some time to provide general safety tips for grain handling. People working in grain handling facilities, particularly young workers, run the risk of being trapped by grain. This is why under federal law workers below the age of 16 cannot work in confined spaces. Multiple deaths injuries have occurred due to workers not being trained in rescue procedures and becoming trapped as well. Pulling a worker out of a grain bin requires more force than rescuing someone from under water, as grain does not have buoyancy. Proper rescue systems must be implemented in grain handling procedures to overcome the resistance. In addition, States may have their own programs that may include additional requirements. It is crucial to remember just how dangerous entering grain bins can be, and to follow the necessary precautions provide by OSHA and state laws. 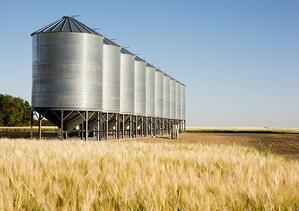 And updated the webpage for grain handling safety and health. For the last two years, Grain Safety Week, has also provided workers with a great resource to bring awareness of the safety issues surrounding handling grain bins properly. The Grain Safety Week website is a great resource for safety meetings and general information procedures and proper grain handling training. Always have an outside observe when working in a grain bin. Always train and practice as often as possible.